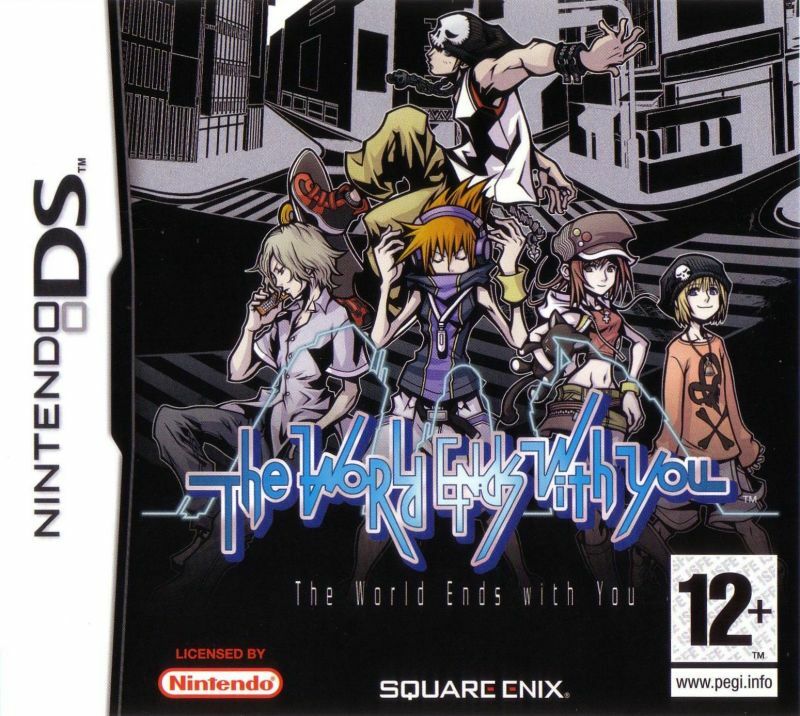 The World Ends With You, often abbreviated as TWEWY, is a JRPG released for the DS on July 26th, 2007, then later released on iOS and Android on August 27th, 2012 and June 25th, 2014 respectively, with a Nintendo Switch Version releasing sometime in 2018. It stars a group of teenagers participating in The Reaper’s Game, where the winner gets a second chance at life after death. The characters can be seen in the cover art above, clockwise starting from the leftmost character, Joshua, Beat, Rhyme, Shiki, and Neku. 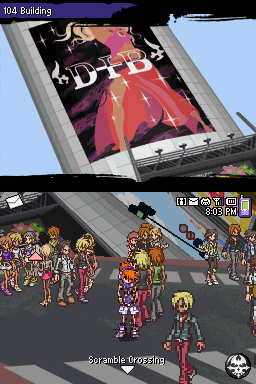 You start the game as Neku, who wakes up in the middle of Shibuya Plaza with no memories besides his name. After noticing a glowing red timer on his palm and trying to ask the people around him for help, he discovers no one can see him. Out of nowhere, he is attacked by brightly colored, tattooed monsters called Noise. Unable to damage them alone, he is saved when a girl named Shiki comes to aid him. They form a “Pact”, a system where they link their life, and being in a pact is also the only way to damage noise. Shiki explains various details about Neku’s situation of being in the Reaper’s Game, telling him that he has died and has been given a second chance through the Reaper’s Game, where the participants have to submit an entry fee to compete(Neku’s being his memories), and to come back to life they need to complete the missions given to them by the Reapers within the allotted time(displayed on their palm), watchers of the Reapers Game who feast on the participant’s souls, and must be the only pair remaining at the end of the week, when the Reaper’s game will end. Throughout his story, Neku meets a few other characters who he becomes friends with, specifically Beat and Rhyme, a brother and sister duo who died in a car crash, and Joshua, a mysterious boy with supernatural powers. I don’t want to give too much away, but Neku partakes in three of these Reaper’s Games, with 3 different partners in each one, developing as a person throughout the events of the game. Now, If I had to convince someone to play TWEWY, I would mention the combat as the first point. It is super unique, fun, and innovative. While in combat you will(and should!) be focusing on both screens, I’ll start by describing the bottom screen, where you play as Neku. To move Neku, you drag him around with your stylus. In fact, you do all of the work on the bottom screen with your stylus. To do damage, heal, buff and debuff, you will be using “pins”, that you can obtain from shops and monster drops. For example, the fire pin, which can be seen above, is used by dragging around the stylus on the bottom screen. Most attack pins are like this(slashing the stylus across the enemy, tapping the screen, etc.). To use healing items like the soda can(seen above), you have to tap on the pin itself. Neku’s gameplay isn’t too complex, but it’s Neku’s gameplay combined with the top screen gameplay which makes battles unique. 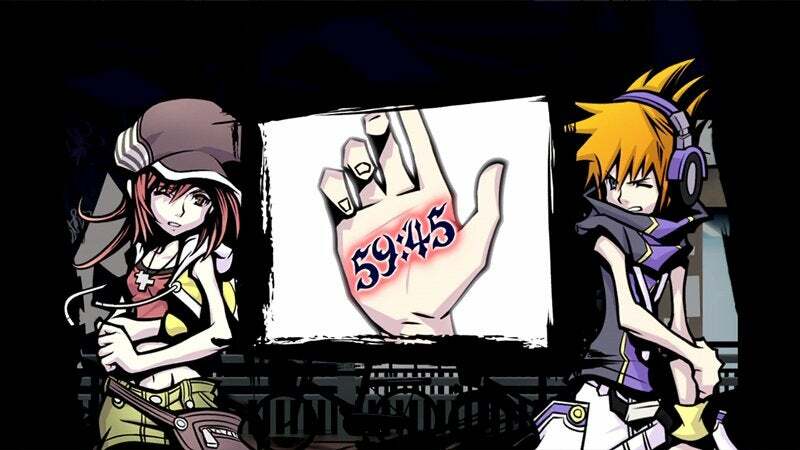 On the top screen, you control Neku’s partner. I’ll be describing Shiki only, since her existence as a partner is not a spoiler and she is visible in the picture above. To control your partners, you use the D-Pad. You hit various directions on it to use various techniques. Each partner has their own interaction with the combos used by the D-Pad. When you combo D-Pad directions with Shiki, you obtain a card. If that card matches one of the hidden cards on top of Shiki’s screen, it flips over. If you flip over all 3 cards, you charge up your duo partner pin. If this pin is used, it basically functions as a powerful screen wipe. This partner pin can be charged up to 3 times, and charging it up is the usual objective of every battle. There are some other mechanics related to the pact. Throughout battle, one of your characters will be surrounded by a light aura. This is called a light puck, and it is a damage multiplier. If you do enough damage with it without getting hit, you pass it to your partner. This can be done unlimited times back and forth as long as you don’t take damage, which is quite hard to do, so it adds some more damage to the battle. Speaking of damage, Neku and his current partner share a health bar, so it is absolutely necessary to focus on both screens, as even if Neku’s half of the health bar is full but Shiki’s half hits 0, that will result in a death. Some people don’t like this mechanic, as they find it hard to multitask between two different battles, but I think it is executed very well and the player should get used to it quickly. Aside from battles, there are some important mechanics in the overworld. One mechanic is the fashion forecast. Instead of equipment like armor and helmets, you wear designer clothes as your protection. Pins can be from designers as well. By continuously using a specific brand of fashion and pin, you can change the fashion forecast, making it match your brands. If the forecast matches your brands, you gain buffs in battle. I didn’t dabble in this mechanic too much, and I did battles just fine without using it, but it’s worth mentioning. However, you’ll grow to find brands you like, such as Wild Boar, which focuses on raising attack. There are other miscellaneous features that I think were great. For one, there are no random encounters. You hit a pin on the corner of your screen, and it shows a bunch of icons. All these icons are Noise. This way, you can fight as many or as little as you want. You can chain together encounters by tapping multiple Noise icons before the encounter starts, which multiples EXP and increases rare treasure drops. Another thing I enjoy is the pin system, there is an incredible amount of pins. The amount that you can buy and find is just overwhelming. And while some of them are just reskins or more powerful versions of previous pins, a large majority of them are unique, and fun to experiment with. When pins level up, they have a chance to evolve. This I didn’t like, as even if a pin can evolve, it won’t always, it’s a random chance. This is just a minor qualm though. The graphics in this game aged pretty well for a DS game, I’d like to think. The pixelized art looks decent enough, but where the game really shines is the hand-drawn art, like in cutscenes or dialogue. This art still looks good even today, which is a pretty great achievement considering the DS’s low resolution screen and the game’s age. There is also a comic book like style with the pin animations and the dialogue bubbles, as well as the progression of the cutscenes. The music in this game is fantastic. It is filled with plenty of genres, like disco and electro, and almost every track is memorable and unique. unfortunately, it can’t be enjoyed on the DS version as much on, say, the iOS port because the DS does not have the best speakers, and most audio comes out pretty degraded. Hopefully the Switch port has audio more akin to the iOS version than the DS one. In conclusion, TWEWY is by far one of the best JRPGs of the past console generation, and should be played by anyone who wants to play a JRPG with great characters, innovative and fun gameplay, a fantastic soundtrack, and interesting story. While it is a little rough around the edges and has a few irks here and there, it is a quality game that is still worth playing today. Score:8.5/10; Battle system is quite hard to get used to, some mechanics are overly complex, and music for the DS version is a little degraded, but aside from that it is a solid, above-average game that is no doubt a gem.